Who says patriotic decorations are only for the summertime? 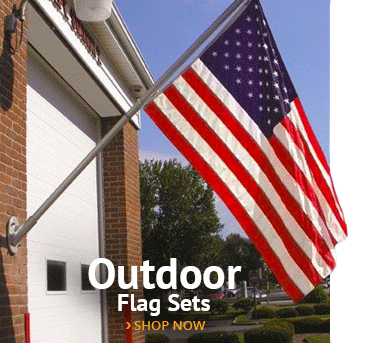 We think the holidays are the perfect time of year to show your patriotic pride, whether you invest in a high-quality, all-weather American flag for the exterior of your home or get creative more unconventional decorations. If you’re looking for amazing ideas for how to fuse the red, white, and blue with the red and green, look no further! Here are some fantastic ways to decorate with patriotic holiday décor. Decorate a Patriotic Christmas Tree — There’s simply no better way to show your love for Old Glory during the most festive time of year than with an all-American holiday tree complete with patriotic Christmas ornaments. 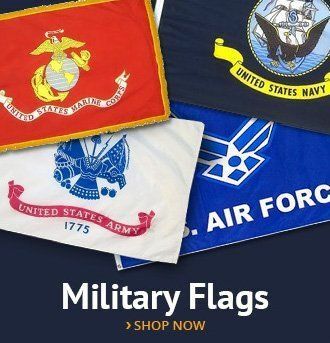 Stock up on various classic American flag Christmas ornaments and pepper in your favorite military ornaments for a tree that pays tribute to the Land of the Free! Of course, you’ll want to make sure you weave in some star-spangled ribbons or garlands for an extra pop of patriotism. Don’t forget to top your tree with an American-made star topper! 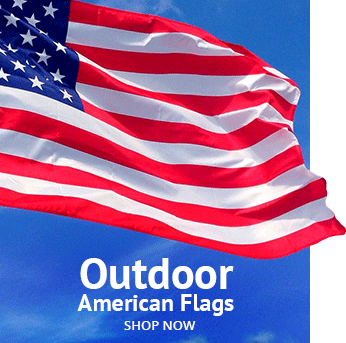 Wave Decorative Holiday Flags — No all-American exterior is quite complete without an American flag, but you can give the outside of your home an even more festive and patriotic feel with the help of holiday flags and banners honoring your favorite holiday icons. These classic exterior banners bring festive messaging and cheer to any home with depictions of Santa, snowmen, reindeer, and trees. You’ll want to swap your holiday flag out for a New Year’s Flag after Christmas, and then keep it updated for holidays throughout the year. Pepper in Some Americana — If you love the rustic, country-inspired look of Americana décor but don’t want to decorate in this style year-round, then the holidays are the perfect time to do it. Choose Americana holiday décor that features flag motifs in red, white, and blue. Another great way to weave in this stylish theme with your Christmas décor is to pair it with patriotic signs and plaques. Hang a Patriotic Wreath — How do you fuse the spirit of the holidays with the pride of Old Glory? One simple way is with fresh, winter greens and poinsettias. Create your own one-of-a-kind American holiday wreath using fresh evergreens and plenty of burlap or ribbon featuring the stars and stripes. You can also take these simple DIY American flag wreaths and add a holiday flair with berries, mistletoe, and pinecones. Don’t forget to finish it off with small, decorative American flags for an extra layer of pride. Decorate the Hearth the American Way — Besides the Christmas tree, the fireplace is the most obvious place for holiday décor. You can give it a patriotic makeover when you drape red, white, and blue garlands—or homemade paper fireworks—from the mantel. Americana Santas and small, wooden holiday trees are always essentials for your holiday fireplace décor! American flag bunting also looks great when draped from the fireplace, but be sure that you’re not putting Old Glory in harm’s way. Turn Your Wrapped Gifts into Décor — If you’re feeling extra-ambitious this holiday season, get all your shopping done early so you can use your wrapped gifts as décor under the tree. Get creative when you wrap presents using American flag motif wrapping paper plus patriotic ribbons and bows. If you’d rather take a subtle route, wrap your gifts in eye-catching American red paper and top them with pretty blue ribbon. 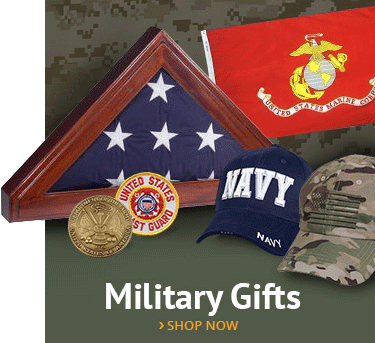 Gold star garlands and ribbons are also a great option because they work well with both holiday and patriotic décor. Light Up the Exterior of Your Home — Draw attention to your favorite year-round decoration, the star-spangled banner, when you use Christmas lights to illuminate your exterior flagpole. 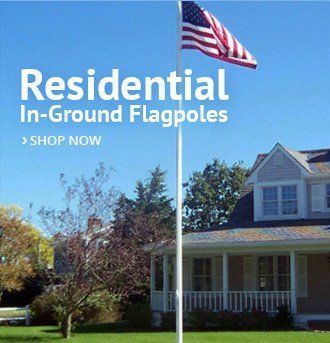 Keep it classic with simple, white LEDs wrapped around the pole to ensure that the flag itself remains the focal décor. There are also a variety of holiday light kits that you can use to transform your flagpole into a bright, whimsical holiday tree. We love to see patriots stringing red, white, and blue Christmas lights along the exterior of their homes for a prideful approach to the holidays. This entry was posted in Flag Etiquette, Patriotic Decorating by Administrator. Bookmark the permalink.